Sensory processing is a term becoming more and more familiar to parents. However, there are still a number of misconceptions, and sensory processing might look different than you expect. There are often sure fire ways to know your child has sensory issues. However, there are also some behaviors that get overlooked. It took me eight years to really understand that this was an issue for my child, and I wish I had seen the signs earlier. When looking at sensory processing, parents often assume that their child with sensory needs will become overwhelmed by and shy away from too much stimulus. Loud noises will be challenging. Crowds will lead to melt downs. Tags and socks that aren’t straight will drive a child mad. They often have problems with textures so picky eating can be a symptom. A child with sensory needs may not want to touch slime, foam or other such materials because the feel will agitate them. When working with or parenting kids who respond to sensory experiences in this manner, parents quickly and appropriately turn to exploring the idea of a sensory processing disorder. However, the paragraph above doesn’t describe my own child at all, and yet we are still exploring sensory issues. I explored some of the common misconceptions about sensory processing, but what I want people to understand is that each child has been created unique. How sensory needs manifest in one child might look extremely different than another child. While some people think it is all about the child naturally avoiding stimulus due to sensory overload, the opposite can be true. The need for sensory experiences can be great and yet the brain has a hard time regulating the sensory event. Therefore, a child craves and seeks out the experience, but it leads to a negative behavior outcome. Some sensory experiences can be calming to a child and others might result in an explosion of emotions. This was hard to recognize in my child. The frustration and agitation would be bottled up and the meltdown would often come later than the sensory experience, making it difficult to tie the two together. My child can go from 0 to 60 in a matter of seconds. When things don’t go her way there can be a melt down. I believed that she was just acting spoiled, not recognizing that this might be part of how she was made. What her occupational therapist discovered in testing is that she has a highly developed visual cortex. What an amazing gift, right? But with all positive traits, there can be a struggle that comes alongside it. The sensory struggle that pairs with a strong visual cortex is that often times these individuals have a strong visual movie playing out in their mind. Since they have everything planned out visually, when real life deviates from that plan, the brain has a hard time processing the change. The result can be extreme frustration as their brain is already locked on to what should be happening. The outcome experienced in the home is a melt down or fits of rage. My child craved sensory experiences. She wanted nothing more than to be around a lot of people and seemed to seek out things that might overstimulate. She was that creative child who wanted to paint, but she didn’t want to just use paper and a brush. There was a desire to touch the paint and perhaps paint the walls rather than just the paper provided. She loved to get into nail polish, glitter, shaving cream or gak. As a mom, I sought to give her a lot of sensory experiences. 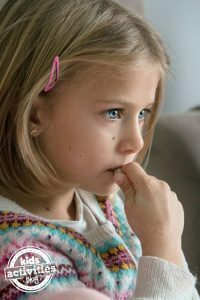 Frustration as a parent would set in when she would seek out these experiences on her own, getting into the craft closet and exploring what glitter and glue would look like on her dresser or bed sheets. Clothes would be drawn on, often scribbling on her clothes at an older age. The sensory need would consume her, but rather than having a calming effect, it would often escalate hyper or out of control behavior to levels that were unmanageable. Other sensory experiences were extremely calming to her, as we discovered more in therapy. She had a high need for pressure on her body, which explains the tight and intense hugging that occurred and wasn’t always welcome by the recipients. The desire to wear jeans that were too tight could also be understood. It explains all of the rubber bands stacked on her arms and wrists. It even gives answers to why swaddling was the one way to calm her as a baby. Wrapping her body tightly in a blanket or letting her chill in her lycra swing is now a strategy we use to calm when she becomes overloaded. Some of the more commonly thought of sensory issues apply to her too: a desire to chew everything, a need to move and have vestibular input, and the fact that she easily becomes agitated. One reason it was hard to identify a need in my child is that she is extremely bright. She performs high academically and has never had obvious behavioral issues in school. She is well liked by teachers and peers. What we didn’t realize is that she had developed coping strategies at school for the areas in which her body was screaming against her. When she felt overwhelmed, she would push her feet intensely into the ground. She would keep her hands in her desk to bend the corners of a notebook over and over again. Her water bottle would be chewed on throughout the day. The stress experienced by any over-stimulus would also build up throughout the school day, and she would let out all that tension at home. This made the after-school experience challenging for our family. Identifying sensory processing as a need is not an excuse for allowing negative behavior to continue, but it’s a recognition that I, as the parent, might need to seek out different tools and try different parenting strategies to teach each of my children in a unique way – just as they are each uniquely made. In therapy, I am reminded that our goal is to give my child and myself the strategies to positively handle the challenges that may come. Further, the occupational therapy is aimed, not to pacify, but to actually create new pathways in the brain. I am hoping our story might give you some of the tools, answers and understanding about sensory processing. It may have caught you off guard that sensory processing might look different than you expected. Light bulbs might be going off in your own brain about some of the behaviors you see in your child. I know that the description of my child is only one snapshot into a sensory kid, and that there are many other stories that deviate from my own and yet fall under the same category. The goal is to become educated and equipped while loving and parenting your child well. I would encourage you to seek more information if this describes your child. You also might find these 35 sensory aids and ideas to help with SPD a great resource. The post Sensory Processing Might Look Different Than You Expect appeared first on Kids Activities Blog.